ICAI is committed to encourage adoption of energy efficient motors. Could you discuss on the ways for improving efficiency standard for motors? International Association of Copper India (ICAI) as an organisation through various initiatives work for improving energy efficiency in various domains like motors, transformers, wires and cables, air-conditioners. In industrial motors, specifically the LT motors which forms the major chunk in the motor family, it is important to improve its efficiency standard. The most obvious method is by reducing its losses through upgrading a better and more efficient design. Here comes the improvement on efficiency levels viz. IE1, IE3, IE3 and IE4. Upgrading the existing Indian standards for motors in line with the global standards and best practices can help in improving energy efficiency. In this regard, ICA is closely working with BIS and IEEMA technical committees. Also, use of advanced technologies like diecast copper rotors enables achieving higher efficiencies in the same frame size. In India, IS 12615 was brought under mandatory certification from 1st October 2017. Will standardisation alone help raising the efficiency bar for motors? You are right when you say that IS 12615 has been made as mandatory MEPS in our country w.e.f. last year. Since then majority of the manufacturers have stopped manufacturing IE1 motors and now the minimum available efficiency class is IE2. But still the switchover has not been completely achieved. For this to happen along with standardisation lot of awareness regarding applicable motor standards and adoption of Higher Efficiency Motors (HEMs) by the end-users has to happen. Also, the support to MSME manufacturing sector needs to be extended in order to gear up for supplying HEMs in market. ICA has been working on capacity building by conducting various kinds of awareness workshops for end users, energy auditors and managers, consultants for adoption of HEMs. The demand for IE2 and above motors has been increasing rapidly due to continuous various reasons. Firstly, by creating awareness regarding benefits of using HEMs in the industries for energy and cost savings. Secondly, efforts made by authorities responsible for driving standards and policy such as Bureau of Indian Standards (BIS) and Bureau of Energy Efficiency (BEE) for climate change mitigation and energy conservation. BEE’s highly successful PAT scheme has pushed many energy intensive sectors to accelerate adoption of energy efficient technologies to reduce their energy consumption and carbon emission. Currently penetration of IE2 and above motors last year has been close to 65 per cent which was only 15 per cent in 2016. What are the major challenges for adoption of HEMs? Despite of knowledge of development of HEMs, the industry has been slow in replacing the existing motors with Premium Efficiency IE3 motors due to several barriers. These barriers exist at all stages in system, right from the buyer, consultant, operation and maintenance staff and also at supplier’s end. 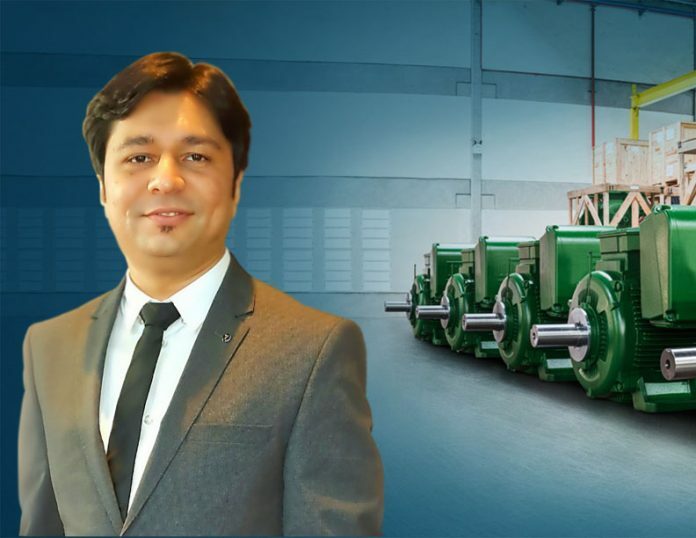 Lot of efforts are required to educate buyer on energy and cost savings, payback period of investment and high reliability, low maintenance offered by IE3 motors. The mindset of user has to change, by spreading awareness on positive aspects of implementation of IE3 motors in existing industry. Biggest challenge is to spread awareness among users. Other barriers existing at different stages are: Higher initial purchase price of IE3 motors; Development of package solution for existing industrial users to facilitate switching over to IE3 motors; Availability of adequate testing facilities to meet testing requirements as per required testing standards; MSME manufacturers still not geared up to produce IE3 motors due to lack of R&D manpower and high investment in design and testing infrastructure; and users opt for multiple rewinding of old inefficient motors rather than replacing with the energy efficient motors. We must complement the efforts of Dept of Industrial Policy & Promotion (DIPP) for issuing a Quality Control Order (QCO) in 2017 for motors to ban import of substandard motors in the country. But then total implementation or compliance of the same is still under question as imports haven’t reduced significantly. It is quite possible these motors are being imported under some other codes which can easily bypass the customs duty. Hence, there is also a need to strengthen the compliance part and make the concerned authorities aware about how the traders can misuse the options available for other special motors HSN codes. Still in India the supply of IE3 motors has not been very smooth not only due to lower demand but also investing in the test facilities and design involves significant investment along with skilled manpower which cannot be afforded by the MSME sector at least. Hence there is an urgent need to understand the challenges faced by the motor manufacturers especially the MSMEs and how they can contribute in adoption of IE3 motors quickly so that IE3 can be likely Minimum Energy Performance Standard (MEPS) in 2-3 years down the line.